Yes, #WeNeedDiverseBooks and #BlackLivesMatter. These hashtags and sentiments are integrated into my many literacy projects and into our ongoing commentary on this troubled nation. Yet, the more I hashtag, the more I wonder if the book industry’s endearing and infuriatingly slow pace can create a place where black lives matter simply by producing more diverse books. Authors and illustrators will do their groundbreaking and childhood-lifesaving work and the publishers will publish them. But, are the consumers, educators and libraries buying enough books? Are they buying at a pace that will expose a child to enough books to show him or her that their lives matter—matter to all of us? Into the middle of these thoughts, a picture book New Shoes by Susan Lynn Meyer and illustrated by Eric Velasquez (Holiday House) landed on my desk. 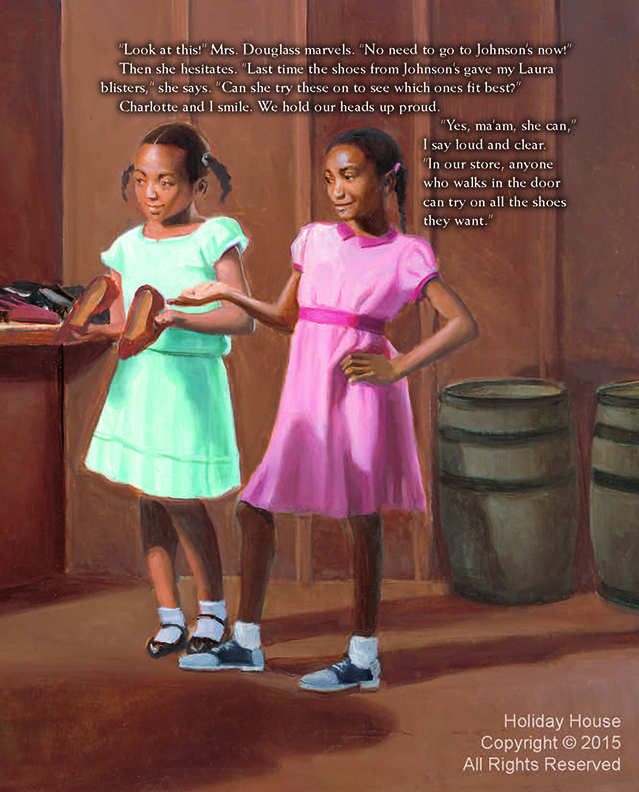 In the book, young Ella Mae is forced to wait for a white girl who came in the shoe store after her and then denied the right to try on the saddle shoes she and her mother have come to buy. 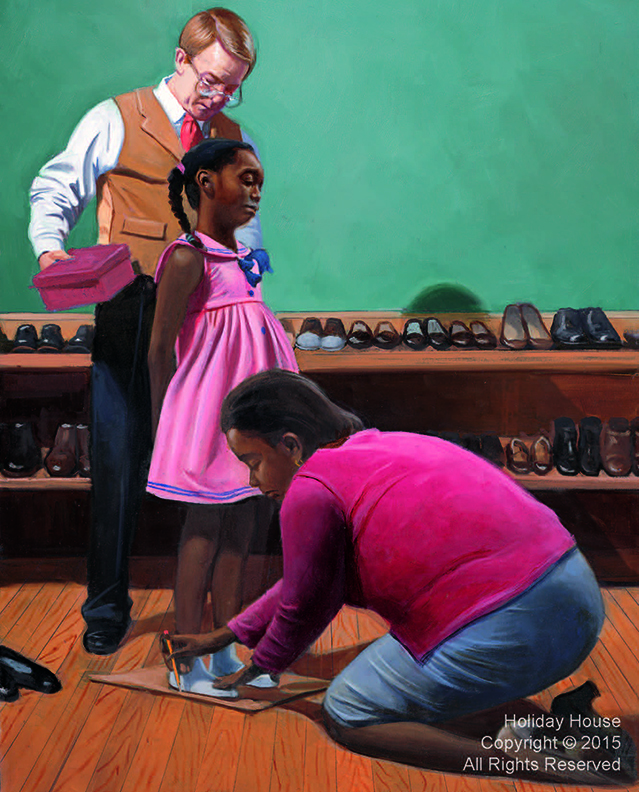 Jim Crow sends Ella Mae’s mother to her knees to trace her daughter’s feet on paper. “That’s happened to me too,” her friend Charlotte whispers when Ella Mae tells her about the store. What makes this story a marvel is that Ella Mae and Charlotte counter this Jim Crow discrimination with entrepreneurship. Doing chores for neighbors, the girls ask to be paid in nickels and old shoes. After rounds and rounds of chores, they go into an old neighborhood barn. There they do not just play store, but create a store. With their nickels and their careful attention, they transform the old shoes into shelves of refurbished footwear. We all strive to have children try out all the books they want. I want young readers to experience the tenacity and creativity of Ella Mae and Charlotte! But how many will? How many families will buy this acclaimed picture book from a bookstore shelf? How many libraries will have the funds to buy it for kids to check out or for teachers to pull from the shelves for a lesson? If books and stories change lives, if diverse books allow children of color to be seen and validated, then why is book purchasing not a major charitable action? For example, if the message of empowerment through entrepreneurship speaks to you and you have the means, why are you not buying New Shoes by the caseload for schools, libraries, and after school programs? Books have meaning and mission, but the industry has always been designed for single purchase use. The bulk sale is rare. 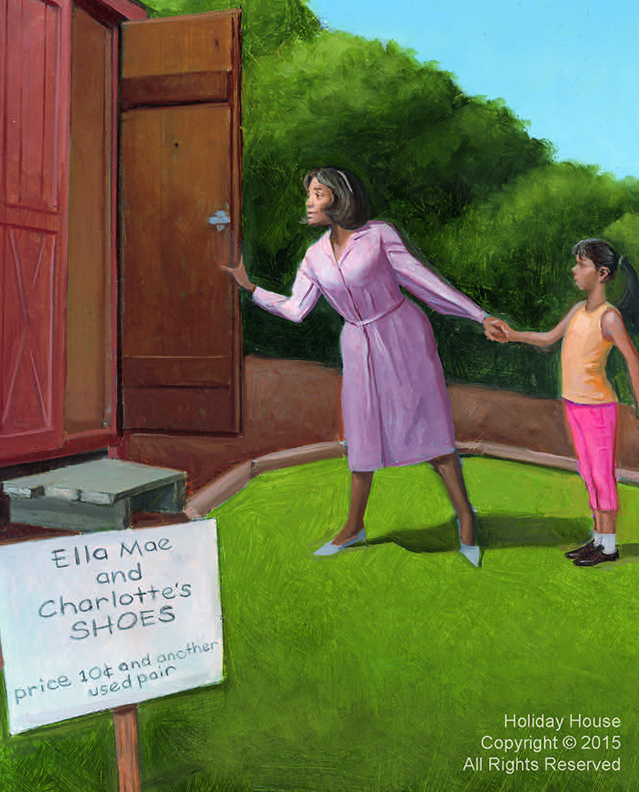 If #WeNeedDiverseBooks, can we not find an entrepreneurial solution like Ella Mae and Charlotte? We certainly can match a person or organization’s mission – to instill a feeling or lesson in children’s minds – to a children’s book that imparts that mission. Public funds for schools, libraries, and many non-profits serving children continue to diminish. These institutions would welcome donated materials. For example, I recently posted an offer on the American Library Services for Children email listserv offering 500 individually-donated paperback chapter books by Polly Holyoke. That offer brought 1,000 grateful schools and libraries to our site in less than 48 hours. They would say a resounding “yes” for books that reflect their community. The statement in New Shoes, “That’s happened to me,” is such a simple and searing statement of subtle and daily discrimination. Those subtle experiences of discrimination remain long after the end of Jim Crow. Can we give kids of all races the tools to believe and act like #BlackLivesMatter by driving charitable donations of books? Is it as easy as setting up in the barn and painting a sign? It might be. Who wants to do the chores and gather the nickels with me? 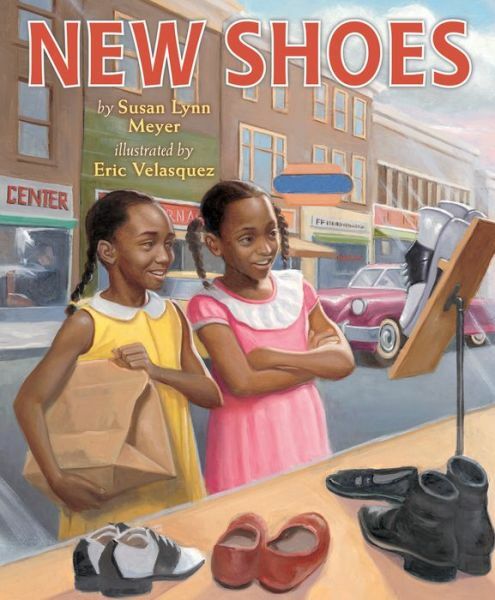 NEW SHOES Text copyright © 2015 by Susan Lynn Meyer, Illustrations © 2015 by Eric Velasquez, Used by permission of Holiday House. Kirsten Cappy of Curious City and Curious City DPW is an advocate for children’s literature and its creators and for schools and libraries. Through creative marketing projects, she seeks to create places where kids and books meet. She can be reached at kirsten@curiouscity.net or 207-420-1126. Sounds like a kickstarter campaign is brewing. On numerous levels, this sounds like a winner. True, true and more true, Kirsten. If we are lucky enough to be in the privileged position of being able to purchase (diverse) books…well, I can’t think of anything that is easier, or more important to buy. As a school librarian with limited funds serving eager young readers of color, I agree that there would be a huge demand for this! It feels tragic that this book seems to have been completely ignored, while controversial books like A Fine Dessert and A Birthday Cake For George Washington steal the spotlight due to controversy.